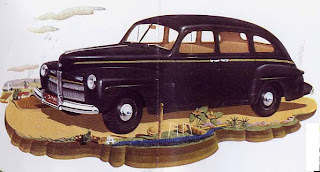 Introduction of the 1942 automobiles in the Dominion was almost an afterthought in light of the fact that Canada had been at war for three long years. News of the global conflict was broadcast daily over the CBC and most of it was grim. The Germans marched relentlessly into the Soviet Union. Kiev fell and Wermacht circled Moscow to launch one of the most horrific sieges in history. With frightening regularity, U-boats continued to torpedo and sink convoys filled with urgently needed supplies, bound for Britain and the USSR. Once in a while there was encouraging news, too. Allied air raids over Hamburg, Stuttgart and other German cities were beginning to cripple the Nazi supply lines. The first of the American-built Liberty ships were released to Britain. War or not, the traditional national unveiling of the latest crop of automobiles took place in October 1941, in the Automotive Building on the grounds of the Canadian National Exhibition in Toronto. The CNE had been requisitioned in 1940 by the government to serve as a major recruitment and training centre. In order for the annual automotive unveiling event to take place, the army moved most of the soldiers from the 192-acre fairground. 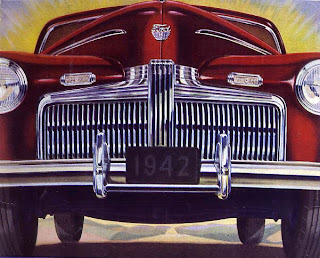 Huppmobile and Graham had ceased auto manufacture permanently. Their absence was noted. Hudson was imported for the second year in a row, the Tilbury, Ontario plant now given over completely to war work. Present and accounted for, the automakers displayed their contributions to the war effort. The Ford Motor Company of Canada, Limited featured one of the largest exhibits. Ford showcased the weapons of war that 10,000 workers were churning out around the clock in its vast Windsor, Ontario complex. 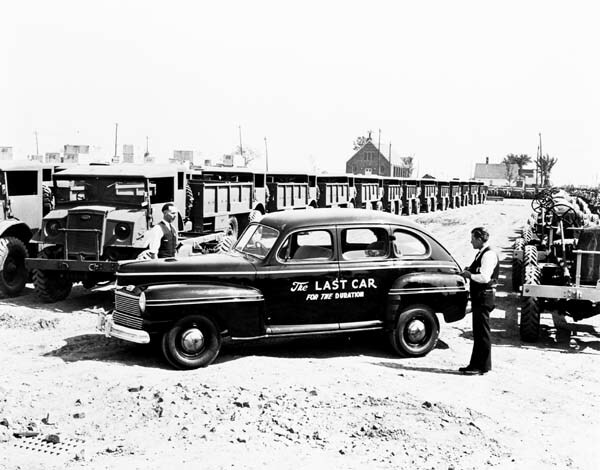 Car manufacture never ceased at Ford Canada, but they were built on a very limited basis; eleven percent of the factory in Windsor was set aside for auto assembly. Rationing had begun in 1941. Completed automobiles for eventual civilian use went directly into a national pool where they were doled out. Only citizens who could show proof that a new car was vital to home front or Empire needs could requisition one. Filling out the paperwork was most daunting. The lucky consumer who was actually qualified for a new Ford got quite a stylish ride. The envelope, new in 1941, had been streamlined and tested in Ford’s Weather Tunnel by engineers. 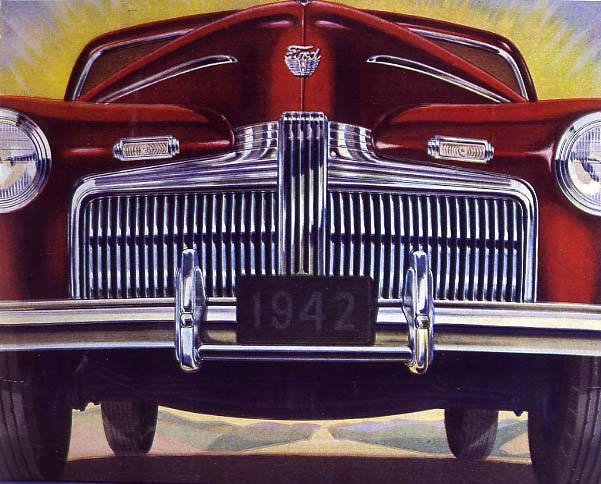 This year, a massive grille was affixed to the 1942 models. The instrument panel was revised, now it boasted a new clock-like speedometer. Oval taillights were prominent on the car’s backside. Among the very few permitted to buy new Fords, records show that five vehicles were exported to Newfoundland under the Empire Emergency Civilian Defense Programme. The YMCA in St. John’s was permitted to purchase three Panel Delivery pickups and a Station Wagon. The Knights of Columbus in St. John’s were granted permission to acquire a Ford Super Station Wagon. War severely reduced the availability of many consumer items. Ford colour choices were limited to five: Moselle Maroon, Yosemite Green, Fathom Blue, Newcastle Grey and Black. All paint was of an enduring baked enamel finish and the fenders were specially treated to be rust resistant. Only three of the automobiles depicted in the 1942 sales brochure featured Fords dressed up with whitewall tires. A black box notice in the pamphlet advised, “White sidewall tires, illustrated in this folder as extra equipment, are no longer available due to war-time restrictions.” Surprisingly, among the standard equipment items listed was a spare tire, something GM Canada cars had done without since 1940. In addition to the three Ford De Luxe models, a wartime Special series was introduced. Touted as having “Features that stand out in a car that stands up!” the virtually stripped Fordor, Tudor and Coupe made up a lower-priced line of offerings. Created for victory, the trio carried virtually no chrome garnish and did without many other niceties motorists were used to. Despite the modest appointments, the cars promised to deliver the same room and riding comfort as its more expensive cousins. 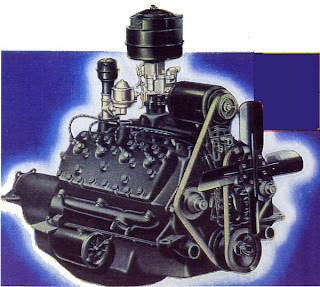 A wide range of extra-cost equipment was available through dealers. Two of the most popular options were the Adjust-O-Matic radio with the Foot Control and Touch-Bar Tuning and the ever-so-necessary Improved Hot-Water Heater-Defroster. The war impacted people on the home front in a thousand very real ways in 1942. Parliament ordered conscription of all able-bodied men between the ages of 19 and 35. Coffee, tea and butter were added to the rationed good list. The Imperial Japanese Army’s invasion of Alaska prompted emergency construction of the Al-Can Highway. A Japanese submarine shelled the coast of Vancouver Island. German Prisoner of War camps opened in Alberta, Ontario and New Brunswick. Nazi spies landed on the Gaspe coast of Quebec by submarine were ferreted out by a suspicious hotel owner and promptly arrested by the RCMP. A German U-boat sank two freighters in the St. Lawrence River. Another U-boat sank the Newfoundland ferry. Bound for North Sydney, Nova Scotia, the “Caribou” went down with a loss of 137 lives, including 31 crew members. Millions of folks would do without cars and much, much more until Victory came in August 1945. With few complaints, they would tighten the belt and make do with what they had. They would sacrifice for King and Country, for the right to fly the Red Ensign and the Union Jack over a land free of Nazi tyranny and Japanese Imperial rule. Wow! I love this blog....because I love classic cars. I don’t know much about classic cars. But with brand names such as Ford, I bet that the engine of this car must be very good. For me Ford cars are still the best. Classic cars had there own identy,not like the junk we see today all looking like they came out of the same mold in japan or korea.we had cars that sounded different smelled different with real leather.And with the computers fuel injection and all the 0/2 sensors dont get any better gas mileage,give me a classic car well tuned any time. I certainly miss my Rambler. Great car, great company. Vintage cars rule! Wow, your cars are very unique. Coincidentally now I am fond of collecting antiques, especially the cars like that and I have an antique cars like that at home. The cars like this I got from the year 1965 but now I do not wear it anymore and now I'm just displaying my antiques as an ornament in the house. Do you also love the antiques?